Enter a historic villa, palazzo, or cathedral in Italy, and you'll find that your eyes are almost immediately drawn upwards. Intricate Byzantine mosaics, ornate Renaissance frescoes, and sumptuous Baroque plasterwork cover the ceilings of many of Italy's most important buildings, a symbol of the wealth and power of the emperors, dukes, and popes who commissioned them centuries ago. The next time you step into one of Italy's landmark buildings, however, don't forget to look down. Many floors can rival the ceilings, and are artistic masterpieces of complex patterns and prestigious materials that have survived the passage of thousands of feet over time. Here are a few of the most interesting floor types, and where to find them. 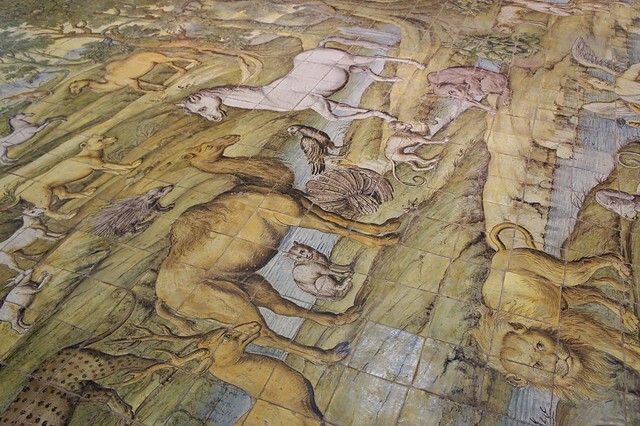 Some of the earliest and most breathtaking floors in Italy are mosaic, made from small marble, terracotta, glass, and ceramic squares called tesserae laid in a pattern to create anything from simple black and white geometric patterns to stunning multicolored compositions depicting flora and fauna, humans and divinities, and complex mythological scenes or historical military battles. The collapse over time of the buildings above these mosaic floors often served to protect them against the ravages of time, and excavations over the past century have unearthed a number of almost perfectly preserved examples. 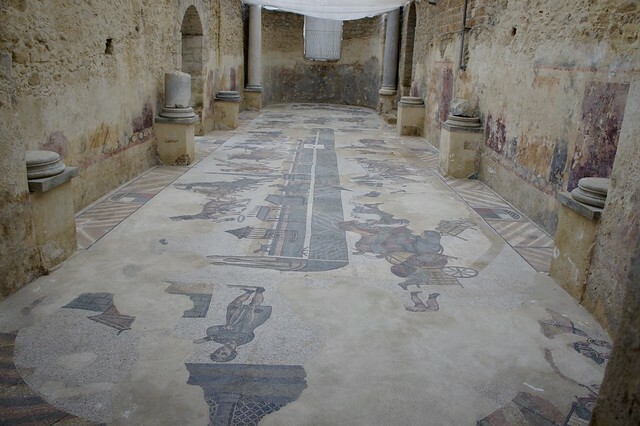 The first Roman mosaic floors date from the 2nd century BC, but some the most beautiful examples can be found in the Villa del Casale in Sicily, built in the Late Imperial period, or about 300 AD. This UNESCO World Heritage Site is home to the largest and most intact Roman mosaic floors in Italy, more than 37,000 square feet uncovered in excavations from 1929 to 1960. 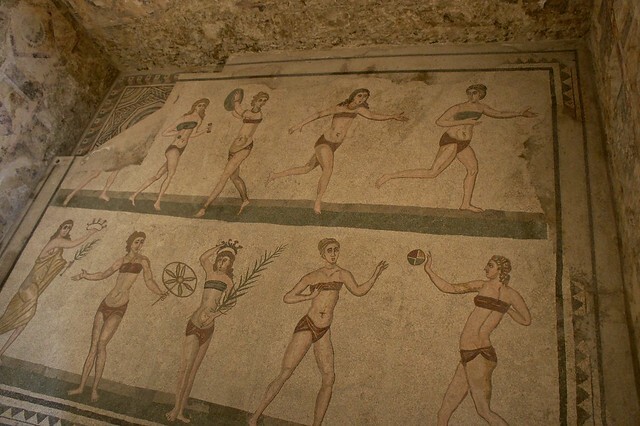 The most famous sections of this expanse of mosaic floors are the "Chamber of the Ten Maidens", also known as the “Bikini Girls”, depicting a group of young women competing in sports including discus throwing and weight lifting; and the massive 3,200 square feet “Hunt”, with its scene of hunters and dogs bagging a variety of game. The direct descendant of Roman mosaics, Cosmatesque floors are made with an elaborate patchwork of geometric mosaics invented by the Cosmati family in Rome, who worked for four generations in the 12th and 13th centuries perfecting the art of the ***opus sectile***—or cut work—technique, in which inlays of delicate triangles and rectangles of colored stone and glass are set into stone matrices or encrusted onto stone bases. The resulting work alternates bands and blocks of intricate mosaic with contrasting bands, guilloches (a repetitive architectural pattern), and simple geometric shapes of unadorned white marble. A number of Medieval churches in Rome have stunning Cosmati pavements, including San Lorenzo Fuori le Mura, San Clemente, Santa Maria in Cosmedin, and Santa Maria in Trastevere, but the Cosmatesque style expanded as far north as Pisa and as far south as Anagni in southern Lazio during the 1200s. One excellently preserved example in Umbria is Spoleto’s majestic Duomo. 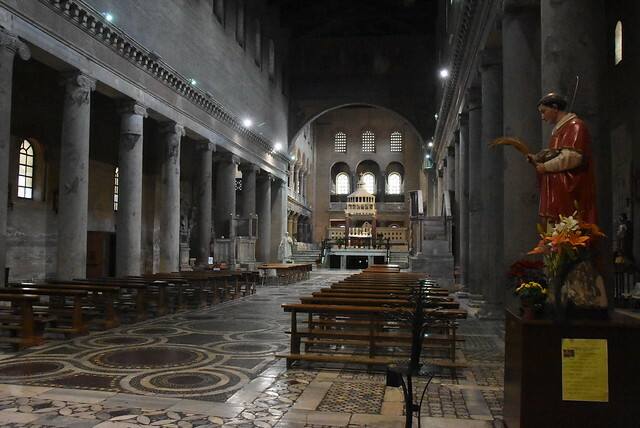 The cathedral's vast Cosmatesque flooring is one of the only remnants of its original Romanesque interior, as the inside of the church was renovated in the first half of the 1600s and most of its former architectural lines lost. The historic pavement covering the central nave and some of the altar luckily survived this unfortunate “restoration”, and is one of the church's treasures, together with the rich “Life of the Virgin” frescoes by Florentine master Fra Filippo Lippi. In much of the world, marble floors are considered the height of elegance and prestige, and Italy is no different. From noble Renaissance palazzi to modern five-star hotels, you can find floors hewn from Italy's many quarries and laid in simple monochrome expanses or patterns made from two or more different colors of tiles. 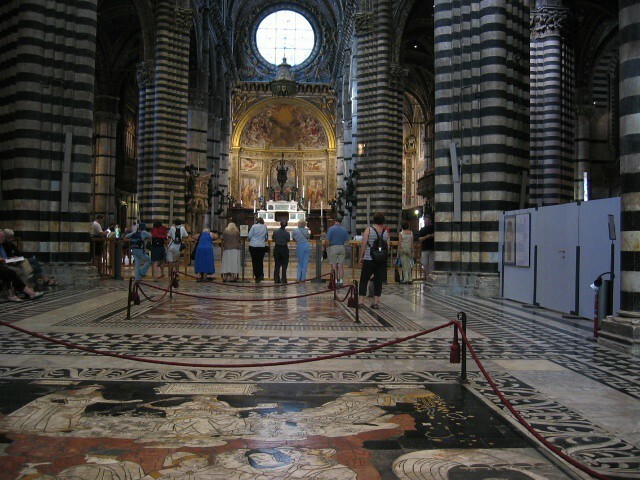 Perhaps the most splendid marble floor in Italy is in Siena's Duomo (http://www.ciuitaly.com/blog/files/siena-duomo-floor.php), where dozens of artists between the 14th and 16th centuries worked to create a one-of-a-kind floor using *graffito, *an early technique of tracing outlines in white marble with tiny holes and fine lines that are then filled with pitch or black stucco, and *intarsia*, inlaid designs using black, white, green, red, and blue stone. 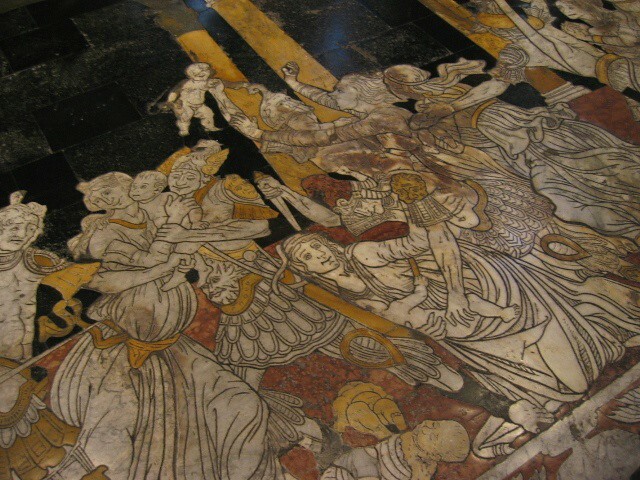 The cathedral's floor is considered so unique and precious that it is protected by large carpets most of the year, which are removed just a few weeks each fall so the public can view this marble masterpiece depicting 56 intricate scenes and allegories from the Old Testament. Cosmatesque floors dominate the churches in and around Rome, but further south along the Amalfi Coast, brightly colored handpainted ceramic tiles from the coastal village of Vietri al Mare cover most floors. Famous for their Mediterranean palette of festive greens, blues, and yellows, majolica tiles from Vietri have been in demand as decorative monochrome roof shingles and geometrically patterned floor and wall tiles since the 14th century. You'll have to hop on a boat and cross the Bay of Naples to the island of Capri to see the most ornate majolica floor in southern Italy, however. 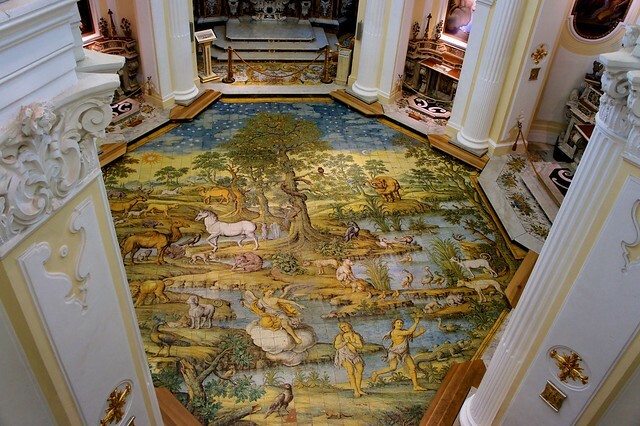 The small Church of San Michele Arcangelo in Anacapri is a pretty Baroque gem dating from the early 1700s, but its most notable feature is the detailed depiction of Adam and Eve being cast out from the Garden of Eden covering the entirety of its majolica floor. To prevent damage to the irreplaceable ceramic tiles, visitors aren't allowed to enter the church but can admire the handpainted masterpiece from raised walkway which runs along the perimeter of the church floor.